Intuitive eating, the ability to rely on your intuition and your body’s own hunger and fullness signals to regulate your intake. 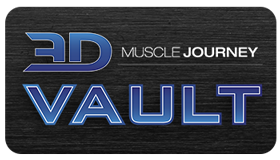 Listening to your body, and eating based upon how you feel definitely has its place in a physique athlete’s toolbox, however this approach might look a bit different than what is traditionally used by the general population. It will vary depending on things such as: that athlete’s habitual intake, the athlete’s body-fat settling point, and where they are in terms of their athletic season (Contest prep, recovery phase, off-season, etc.). Andrea, Jeff and Eric gather together in this week’s episode to discuss this issue. How can you progress from a contest prep diet into an intuitive style of eating? 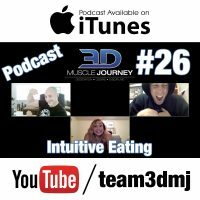 When is intuitive eating an appropriate strategy for a physique athlete in regards to regulating nutritional intake, and when is it not? Should all athletes have the goal of progressing into an intuitive style of eating at some point? All these questions, plus many more in regards to this increasingly popular nutritional strategy are addressed in today’s episode. Tune in to find out!